After the new year, we set out to continue working on Dino’s local tour guide by exploring two different archeological sites near Dino’s home. 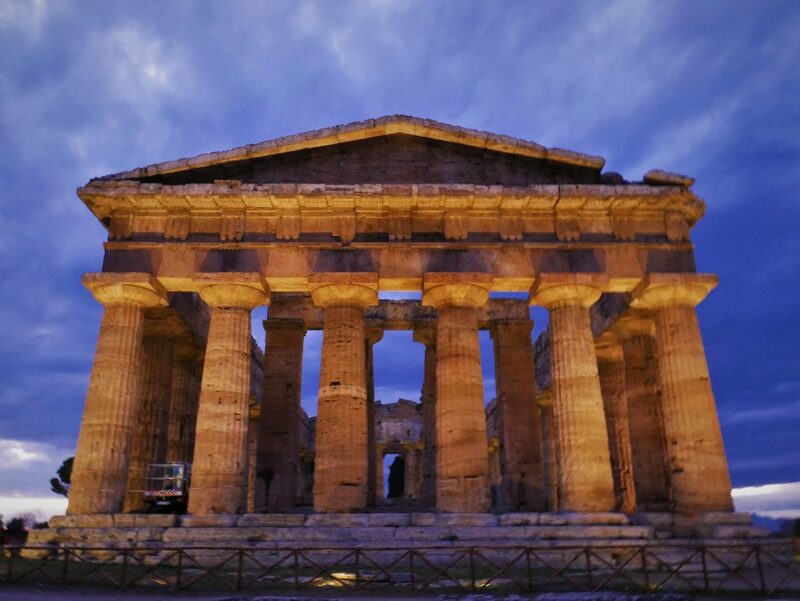 The first being Paestum! 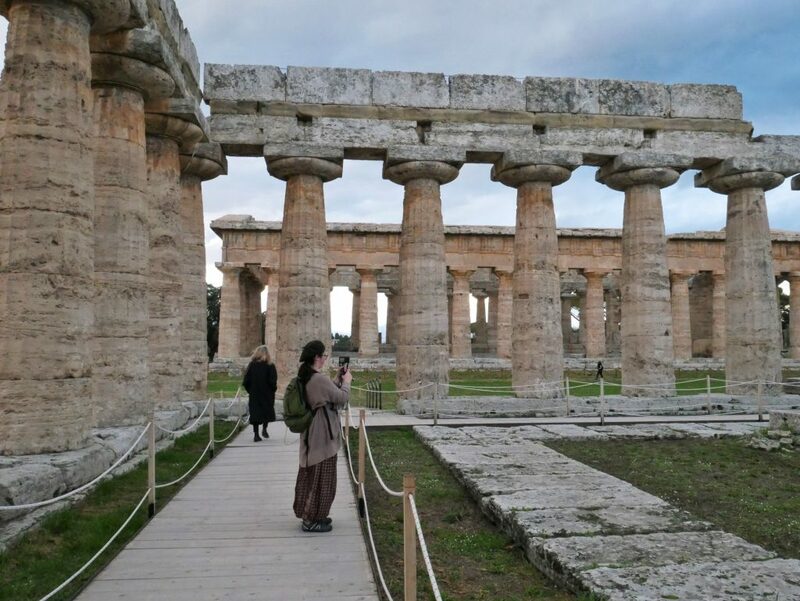 Paestum was a first time visit for Aubre and a return visit for me (Dino brought me here last year), though having already walked this ancient Greek archeological site in no way lessened my awe and wonder. 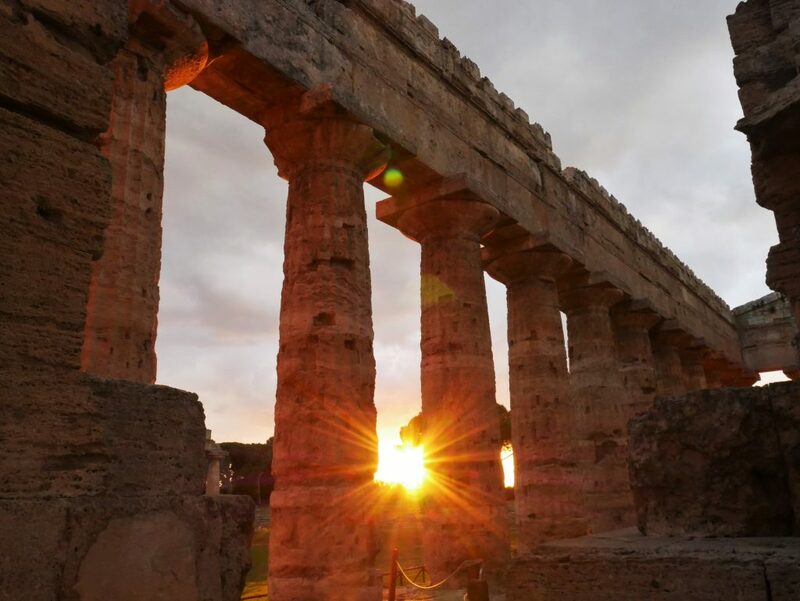 Paestum was founded around 600 BCE by Greek colonists under the name of Poseidonia. 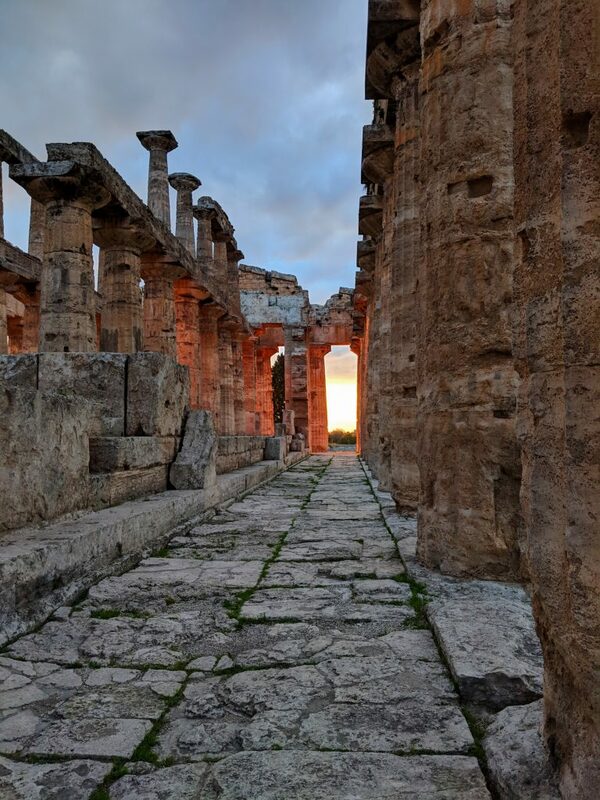 It was a major Greek city on the coast of the Tyrrhenian Sea in Magna Graecia until it was conquered by the Lucanians near the end of the fifth century BCE and renamed Paistos. 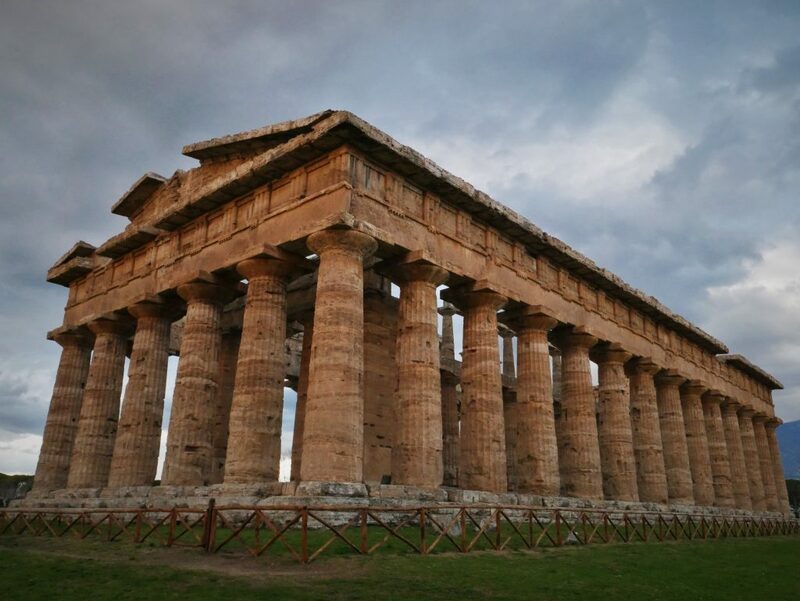 Around 273 BCE it was conquered again by the Romans and given its current name, Pesto or Paestum. The city fell into decline between 300-600 CE, and was completely abandoned in the middle ages. It became overgrown and nearly entirely forgotten until the middle of the 18th century following the discovery of Pompeii and Herculaneum. Enough about history. Let’s see what this place actually looks like! 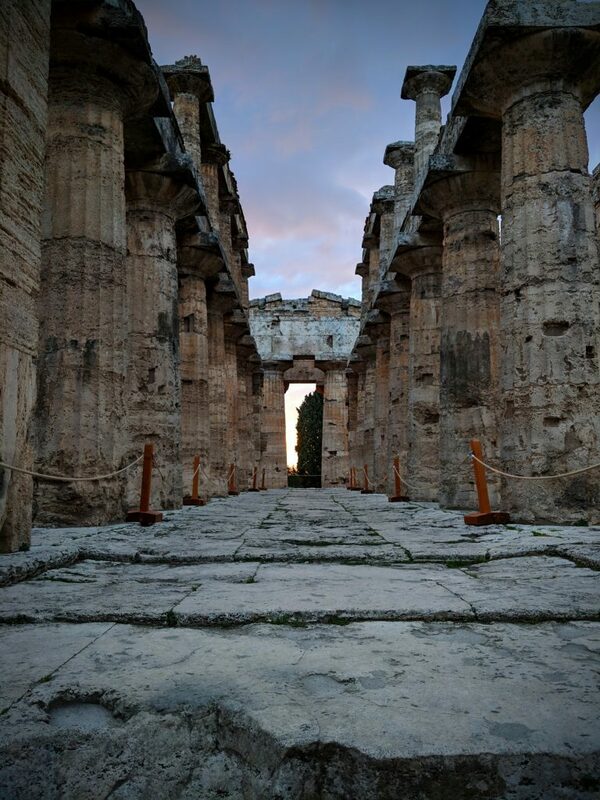 The first thing you see upon entering the archeological site is the Temple of Athena. 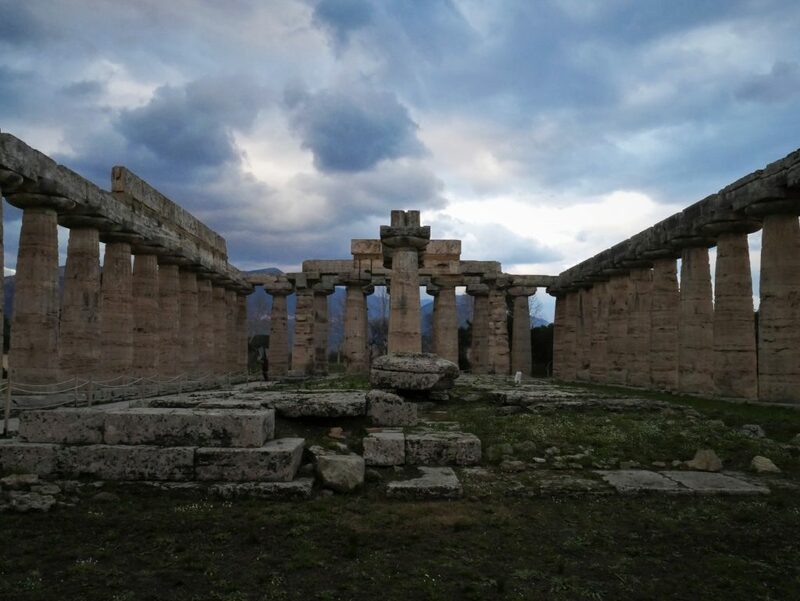 Sitting at about 2,500 years old, this temple was built around 500 BCE. This is also the only templed you can’t enter, so I only have some exterior shots for your viewing pleasure. We then walked down this ancient road surrounded by ruins of old buildings and foundations toward the next seemingly timeless temple. We then came to this massive and majestic temple. 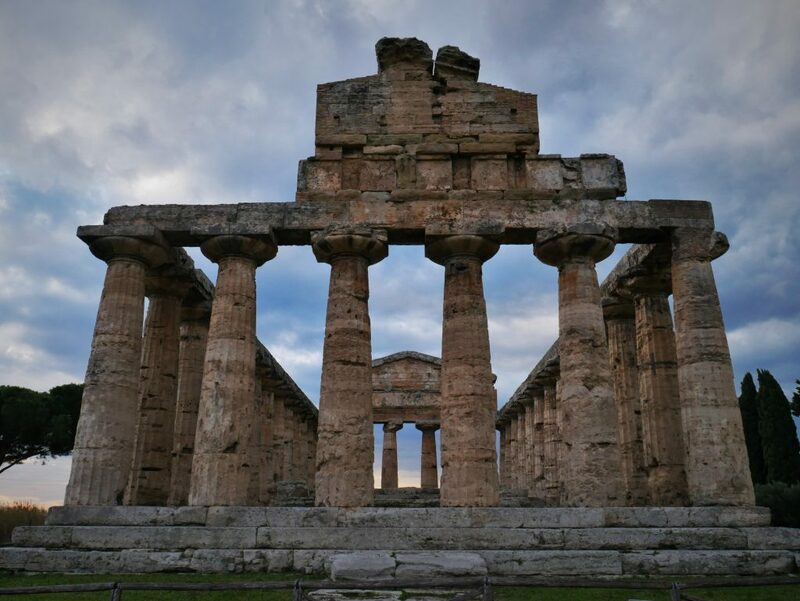 It was built between 460-450 BCE and dedicated to- well, that’s interesting… According to various sources it was originally thought to be dedicated to Poseidon, then later thought to be a second temple of Hera, or a temple of Apollo, or Zeus, or maybe a combination of 2 or 3 of them. 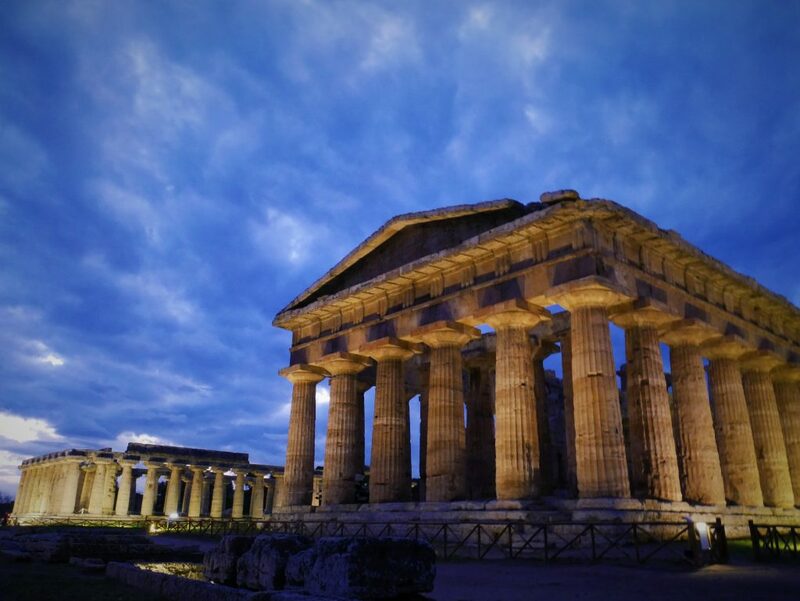 Wikipedia calls this the Temple of Hera II. 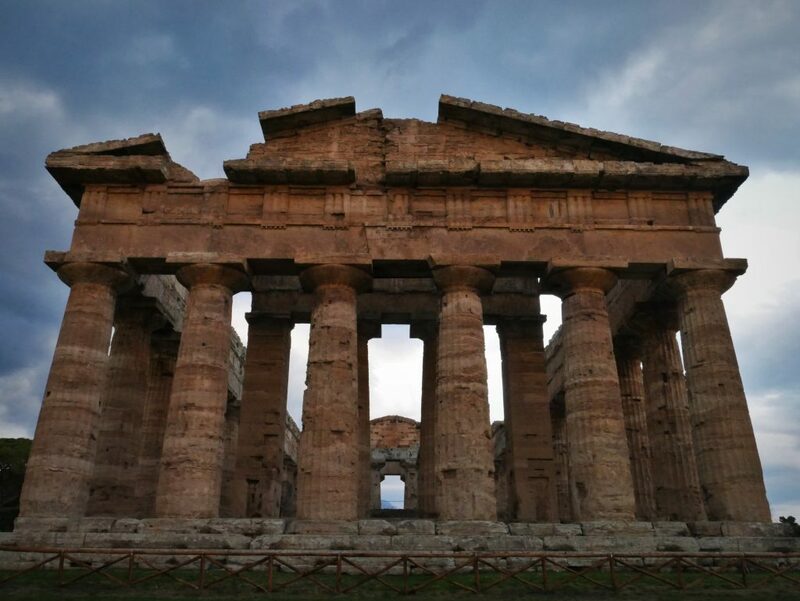 The sign outside it calls it the Temple of Neptune, but amends that it’s likely a temple of Apollo. Last year we’d been able to go inside of it, but this year the gate was wired shut. 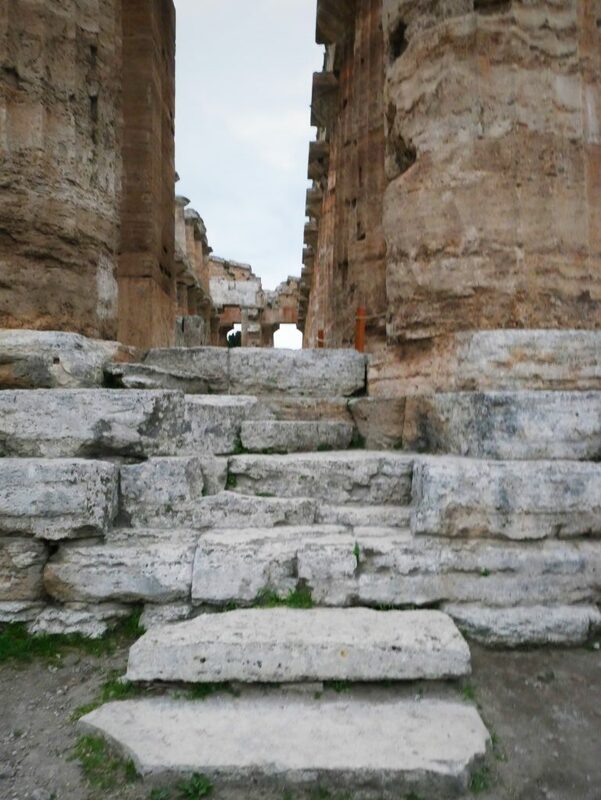 We eventually did find a way in, but not before heading over to the Temple of Hera right next to it. 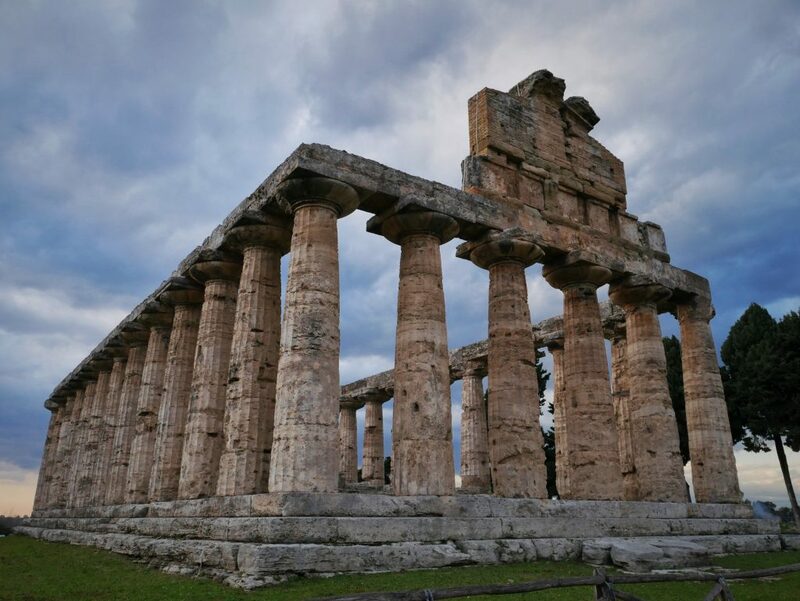 The Temple of Hera is the oldest temple in Paestum, dating back to 550 BCE. 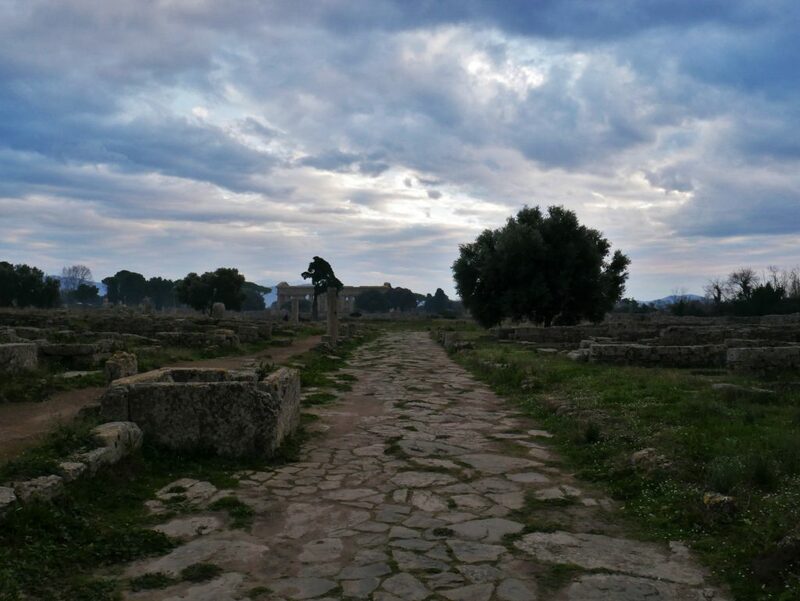 After leaving the Temple of Hera, we found a back gate near the Temple of Apollo(?) that was open. Naturally we walked right in! 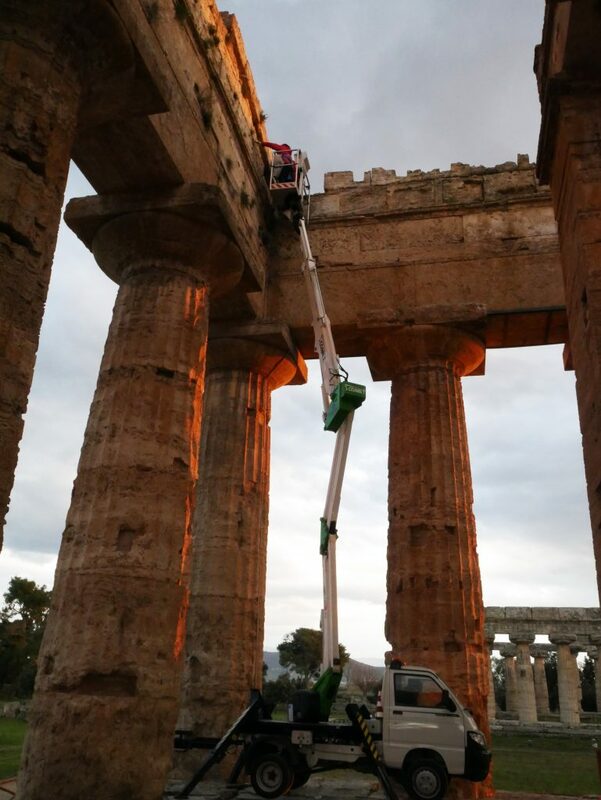 Looks like they were working to remove weeds and other harmful growths from the Temple. We arrived just in time to watch the sun (who had been hiding all day) set from inside the temple. Once again, I’d have no pictures of myself in these amazing places if it weren’t for Aubre! 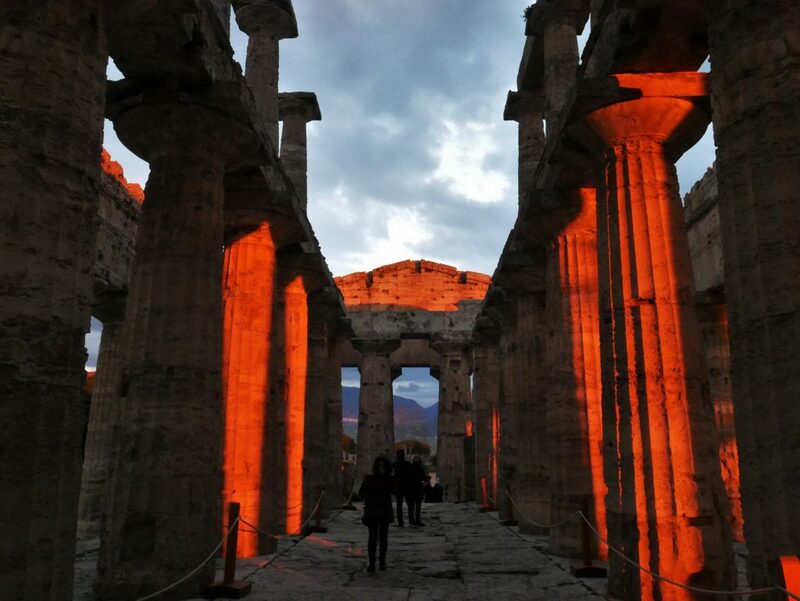 The setting sun lit the temple in a fiery glow. The setting sun setting the mood! Leaving just the cold, 2,500 year old stone. With the sun down, and the winds rising quickly, we jastily began to make our way back to the exit. Suddenly, with the sky darkening, the lamps around the temple came to life casting the whole place in a brand new light! With the pillars alight, this place definitely looked worthy of the gods! If it wasn’t for the biting cold and strong winds that quickly flew into the area after sunset, I would have loved to linger here longer. 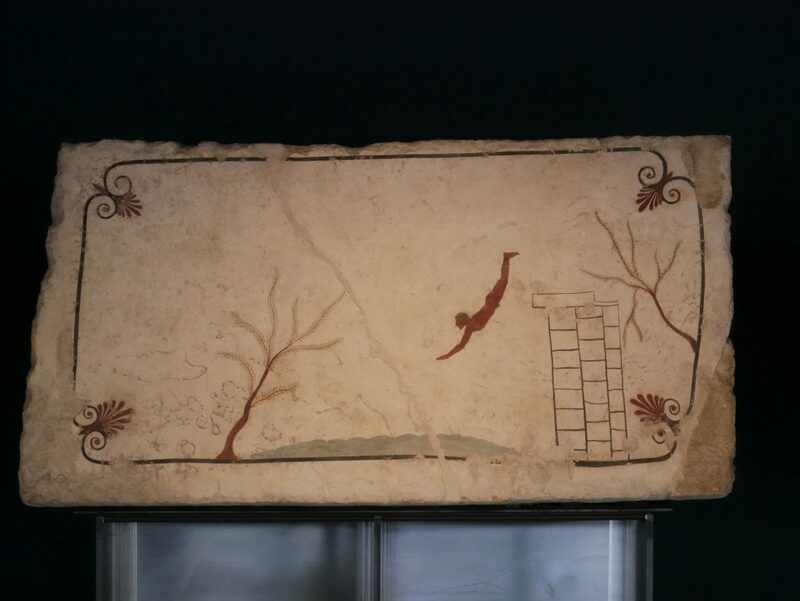 We also stopped by the Paestum museum which has many fascinating finds in it, but I’m only going to show you the one thing I foreshadowed in my last post: The Tomb of the Diver. 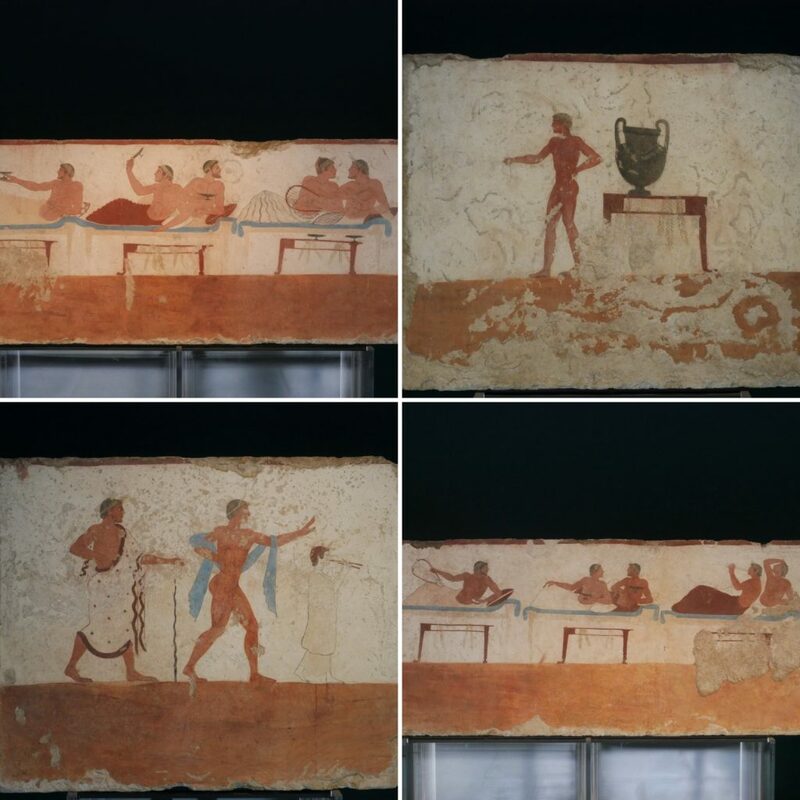 This tomb, found near Paestum, is the only tomb among the thousands of Greek tombs known from this time (roughly 700–400 BCE), to have been decorated with frescoes of human subjects. The lid of the tomb. The walls of the tomb. 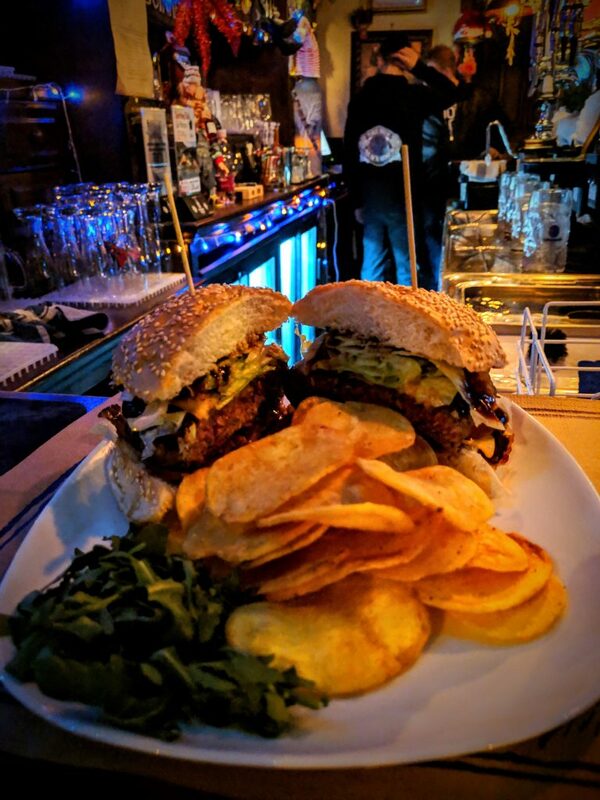 We then battled the howling winds back to the station, and hopped a train to Salerno where we grabbed burger and cider from a local…Irish…pub?! 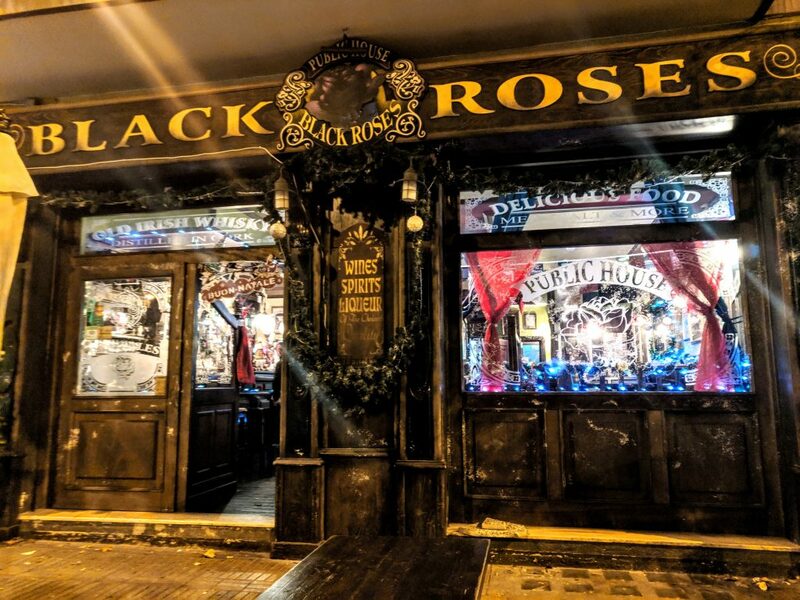 An Irish pub in Italy? 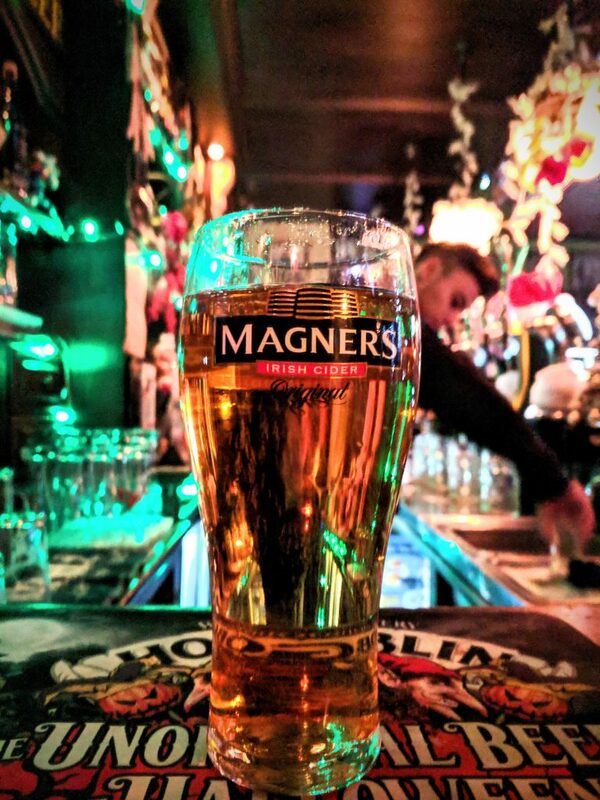 How I missed this cider! With that our first archeological trip was complete! We returned to Dino’s and slept soundly! 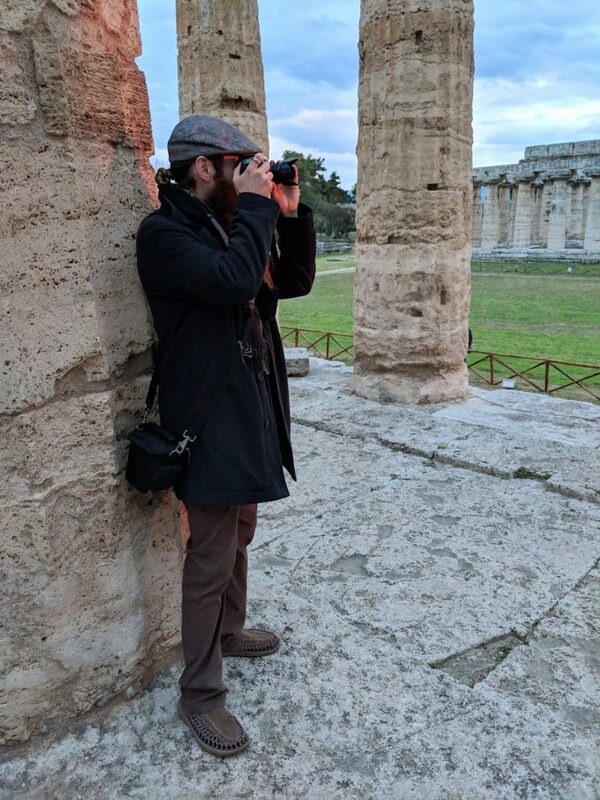 I must say, there’s just something absolutely awe inspiring about walking among the ancient greek temples, and placing your hands on stone pillars that were carved by other humans’ hands 2,500 years ago. 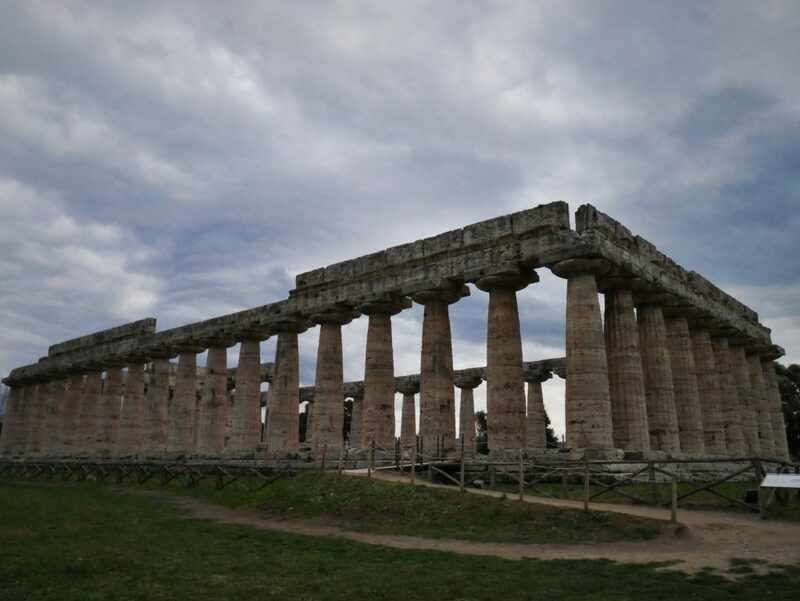 With Paestum behind us, we looked forward to our next archeological expedition: Pompeii! Tune in next Tuesday to join us in exploring the famed city of Pompeii! 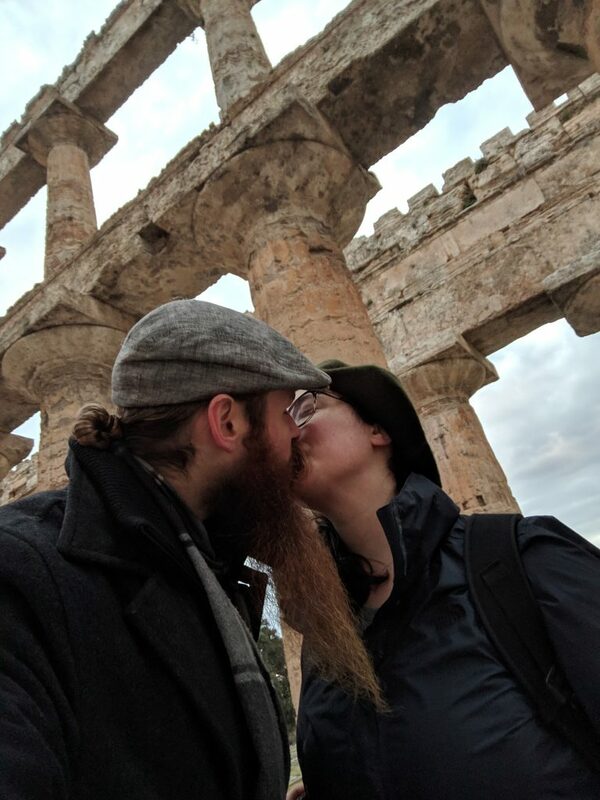 ← Adventures With Dino And Family – Part 6 – Christmas in Italy!